What can improve your mood, boost your ability to fend off infection, and lower your risk for heart disease, diabetes, high blood pressure, and colon cancer? The answer is regular exercise. It may seem too good to be true, but it’s not. 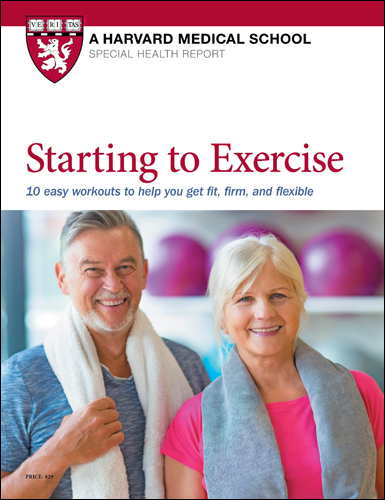 Hundreds of studies demonstrate that exercise helps you feel better and live longer. Starting to Exerciseanswers many important questions about physical activity. It will also help guide you through starting and maintaining an exercise program that suits your abilities and lifestyle. Almost anybody can safely take up walking, and light to moderate exercise is usually fine for healthy adults with no troublesome symptoms. But do you need to talk to your doctor before taking on a more strenuous regimen? It’s wise to talk to a doctor if you have any questions about your health or plan to start more vigorous workouts, especially if you haven’t been active recently. Listen to your body. Hold off on exercise when you’re sick or feeling very fatigued. Cut back if you cannot finish an exercise session, feel faint after exercise or fatigued during the day, or suffer persistent aches and pains in joints after exercising. If you stop exercising for a while, drop back to a lower level of exercise initially. If you’re doing strength training, for example, lift lighter weights or do fewer reps or sets. Dress properly for cold-weather workouts to avoid hypothermia. Depending on the temperature, wear layers you can peel off as you warm up. Don’t forget gloves.